This picture is worth a thousand words. Maybe closer to 200 words (the length of this blog post). 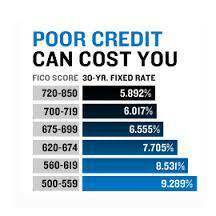 Having a low credit score can cost you dearly! Don’t let your credit score ruin your life! 1. Job! Most employers are starting to run a credit check BEFORE making their decision to hire you or not. They want to see if you are honest and trustworthy. And they are especially hard on lawyers who want to pass the bar. 2. Housing! This one is a no-brainer. I bought a house even though I had an eviction on my record. I also went the no-money-down route! And I paid for that mistake. NEVER buy a home with no money down! My interest rate was over 10% when it could have been 6%. 3. Low Purchasing Power! Look at the picture above again. Stare long and hard. (Give me 1 more second to crunch a few numbers.) OK, I’m ready! The monthly payment on a $100,000 home if you have great credit is $592.62 (because your interest rate is only 5.892%). On the bottom of the scale is a payment of $825.50! Because your interest rate is 9.289%. Yikes! The same example works for car loans! 4. and 5. The next picture will do the talking for me! I encourage you all to be VERY careful with how you spend your money! 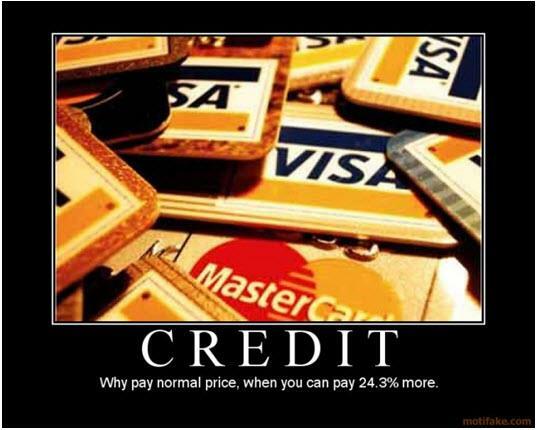 I’ve been there and done that when it comes to both good and bad credit! I once had an auto loan so horrible that I paid 22% in interest on a 1998 Chevy Cavalier! Yes a Cavalier! But I made every single payment on time and that helped to improve my credit score! Need to know how to improve your credit score? Check out my blog post titled: The 7 Best Ways To Clean Up Your Credit! I’d love to hear your stories about your credit score and how it has helped (or ruined) your life! After my credit score dropped drastically, I am now aware of the difference in purchasing power. Although I’m no longer interested in financing items, I still would love to raise my credit score. I totally feel you Shirria. I may be out of the financing game for a little while! But your credit score will rebound. Just keep watching it. I check mine on CreditKarma like every day!